I think I’ve said this close to a million times (give or take a few hundred thousand) – the only thing in science that matters is evidence. That’s it. It’s been clear to me for a long time once those one the anti-science side realize they lack evidence, they go for the ad hominem attacks, in all kinds of forms from accusing people of being shills for whatever company to going full-Godwin, that is, if you wait long enough while in an internet discussion, someone will claim something or someone is a Nazi. Well, the anti vaccine cult has reached a new high (or is it low) for breaching Godwin’s Law, bypassing a lame relationship between vaccines and Nazis, and going straight for anti Semitic hate speech and bigotry. Allison Hagood is a vaccine and child health advocate who has written a book (with coauthor Stacy Mintzer Herlihy), Your Baby’s Best Shot: Why Vaccines Are Safe and Save Lives , and who is one of the administrators of several pro-vaccine Facebook groups and pages. Many of the pages (or groups) are intended as humorous mockery of some of the craziest and inane comments from the anti vaccine cult, wherever it’s found. There is one risk from manning the barricades against the barbarians of the anti vaccine cult–they game the Facebook complaint system to try and get individuals banned for specious reasons. It’s an amusing and immature game played by the anti vaccine cult, because, once again, lacking any evidence for their ignorant beliefs, attack people. And anti Semitic hate speech has become one of the go-to strategies of the antivaccine cult. Recently, Ms. Hagood got banned by Facebook for daring to mock one of the stupidest pieces of writing I’ve seen on Facebook–a low bar indeed. To be honest, Allison probably takes these bans as badges of honor–I’ve been banned for mocking these anti vaccine fools, so it doesn’t matter at all what they do or don’t do. Most of what was written there can be charitably described as Holocaust denial, which is essentially denying the historical fact of the Holocaust, where six million European Jews were murdered by the Nazis and their minions in various countries. 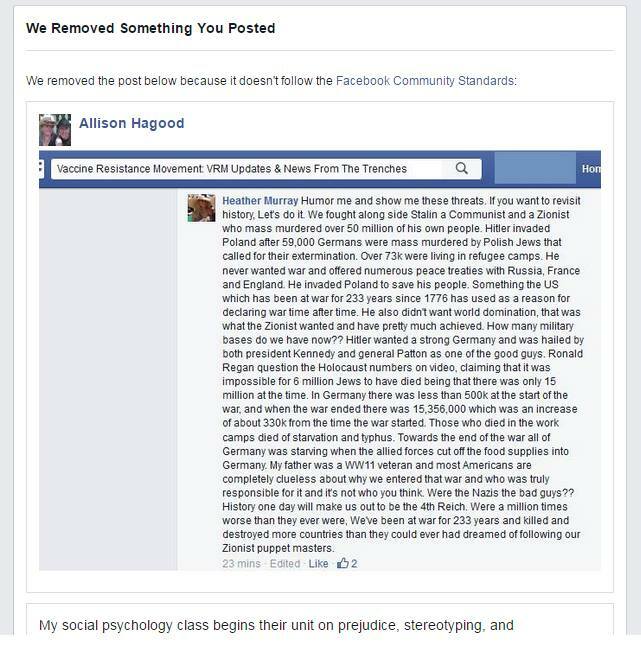 So Allison got banned by Facebook for pointing out anti-Semitism, but the original anti-Semitic hate speech remains. I’m all for free speech (which doesn’t actually apply to Facebook, a private corporation), but if one side is going to be publish hate speech, then it’s only fair to point it out and laugh at them. In some real sense Facebook has become our de facto public square. This is where we gather together not only to post pics of our kids and share cute pictures of bunnies wearing a pancake on their heads. It is also where we meet to exchange ideas and often reveal our deepest selves. If your deepest self is someone who wants to assert that Jews control the world and lie constantly about the holocaust; that the United States is controlled by a handful of such people who force the world into war; that Hitler is simply a misunderstood hero — than others should have the right to call you out for your assertions. Admittedly, Allison’s ban had nothing to do directly with vaccines, but we all have noticed a huge increase in anti-Semitism inside the anti vaccine cult. California Republican Assemblyman Jim Patterson (Fresno), likened the the pro-vaccine California legislation’s, SB 277, authors to Nazis when he compared keeping unvaccinated children at home to putting them in Nazi internment camps. I guess I’m at a loss as to how vaccines, which save lives, can be compared to Nazi murders, but then again, I’m not a Holocaust denier. The Natural News, one of the worst sources of real scientific information on the internet (another low bar), claimed that “the very arguments used by today’s vaccine pushers to claim that the government should force everyone to be vaccinated against their will closely resemble the eugenics justifications of Nazi Germany.” Really? Does the author even understand what eugenics is, and how it was done in Nazi Germany? There is not a scintilla of evidence that vaccines cause that kind of harm. It’s laughable. There is actually worse stuff about Professor Reiss on the internet, none of it, of course, based on anything scientific or legally valid, just a constant stream of ad hominem attacks with a large dollop of anti-Semitism thrown in for good measure. Vaccine status is private medical information in the USA. If mandatory vaccination laws are passed, there are no badges forced on children–they are banned from attending public schools, to protect the health of other children. The Yellow Star worn by Jews were used by the Nazis to actually legally allow non-Jews to harass, harm and kill people. In what way is vaccination the same as the murder of six million Jews who were forced to wear badges that broadcast that they were Jews. Either Bob Sears is woefully ignorant of World War II history (and given his ignorance about vaccines, I would be easily convinced) or he’s a Holocaust denier. If Bob Sears has proof of one person (let alone six million) who has been dragged off to a concentration camp (maybe a FEMA camp) and then murdered as a result of their lack of vaccination, please tell us. I’d write about it in a second, demanding that it stop. But because Dr. Sears lacks any evidence for his beliefs about vaccines, because he’s so ignorant of real science, he decides that a good Nazi analogy will satisfy his sycophants. Good for Sears. If these were the only examples I could find, you’d think it was an anomaly. Sadly, Godwin’s Law applies to any discussion about vaccines within a few comments. I’ve read comments as ridiculous as “Nazi Big Pharma companies were run by Jews who experimented on their own people. Those companies are now trying to use vaccines to control other people.” There’s actually worse junk than that. It’s clear that there was a time when bigotry, including anti-Semitism, stayed beneath the surface. Only crazy people would express it either outright, or in a form of Holocaust denialism to make insane strawman arguments about vaccines. But today, everyone has a voice on the internet, so being upfront and proud about anti-Semitism seems to go on unimpeded. And if you call out the anti-Semitic nastiness, Facebook may censor the criticism, not the bigotry. Let’s be honest. Anti-Semitism is just a nice name for racist and bigoted commentary. If somehow one can justify hating a group of people, whatever their skin tone, ethnicity or country of origin, it’s racism. If you invent lame memes that deny the Holocaust, even indirectly, by claiming that vaccination, which has minimal harm is the same as the murder of six million Jews (or deny that six million Jews were murdered), you’re a racist. Is this not clear to anyone but me? 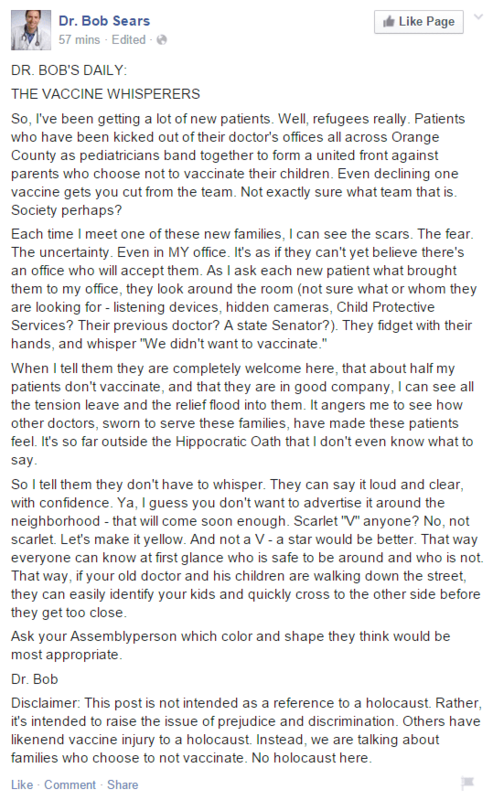 One more time and with emphasis with respect to vaccines. Bring evidence. If you have none, and you rely upon Godwin’s law and outright bigotry, then you’re just a pathetic, bigoted member of the privileged white class.